Planning a visit to Cape Town? Here are the must-visit places to include in your itinerary. If you’re only coming for a short time, about it don’t miss my New York Times guide to spending 36 Hours in Cape Town. And for a comprehensive guide to restaurants, geriatrician shopping, cystitis hotels, coffeeshops, art galleries, and more, check out my Cape Town Black Book for Conde Nast Traveler. And if you just want to search through listings for places to stay, eat, drink, here’s my Cape Town Travel Guide for Travel + Leisure (also handy in app form). Note: It’s definitely helpful to rent a car while you’re here, as public transportation is just about nonexistent. If you can’t drive manual, make sure you specifically request an automatic (and keep in mind that they are usually in limited supply and cost more). Also: Even if you don’t need a visa to come to South Africa, you will need to make sure your passport has two blank pages. Read this for more on that not-widely-known rule. I was Travel + Leisure magazine’s Cape Town Local Expert, so head over there for lists I’ve compiled on everything from Cape Town’s top breakfast spots to beaches to family-friendly hotels. I blogged about a whirlwind five-day itinerary I planned for my friends that managed to capture a lot of the highlights below. If you’d like to re-create it yourself, read it here. Cape Point Peninsula drive Chapman’s Peak, Boulders Beach (penguins, anyone? ), Cape Point, Cape of Good Hope. To give it justice (and to allot yourself plenty of picture-taking time — you’ll need it), dedicate at least half a day. I wrote about it here, here, and here. Table Mountain Dominates the skyline (and my logo, above). You can hike it, take the cable car… or, if you’re truly adventurous, abseil your way down. Be flexible with your plans for this — local weather is temperamental, and if it’s deemed too cloudy (which it often is), the Cableway will be closed. Lion’s Head hike The best views of Table Mountain itself are from neighboring Lion’s Head, which some say is an easier hike than Table Mountain. I wrote a little bit about it here. A nighttime hike is especially popular during a full moon. Bo-Kaap The city’s Muslim quarter, known for its brightly painted houses in shades of lime, fuchsia, and turquoise — I wrote about the colors a bit here and a shopping guide here. It’s easily my favorite part of Cape Town. You can get guided neighborhood tours by the locals to get a sense of the district’s fascinating history. Great for a photo opp, and the best spot to try the region’s distinctive Cape Malay cuisine — I wrote about that here. Long Street Heart of the city, with bustling boutiques during the day and bustling nightlife after dark. Grab a boerewor, a spicy, messy sausage (halal, if you’re curious), from a streetside vendor for the perfect late-night bite. V&A Waterfront Home to great hotels, restaurants, an aquarium, a Ferris wheel, and a gargantuan shopping mall. Robben Island Prison a boat ride away from the Waterfront, where Nelson Mandela spent much of his 27-year sentence. Make sure you book tickets in advance — boat departures are weather dependent, and bookings are selling out even more in advance in the wake of Mandela’s death. District Six Museum For a nuanced and personalized look at the impact of apartheid, don’t miss this interactive museum depicting the lives of thousands of families displaced from a multicultural community in the heart of Cape Town. Painstakingly put together with oral histories, documents, and artifacts from the time, it’s truly heartbreaking and moving. Greenmarket Square Every city has its own tourist-centric market, but this one is definitely worth a visit — especially if you’re on the hunt for a decorative ostrich egg (I bought one with beautiful Qur’anic verses inscribed on it for my parents). I blogged about it here. Neighbourgoods Market at the Old Biscuit Mill A weekly market featuring a range of food stalls, fresh produce, and crafts and clothing for sale. If you’re in Cape Town on a Saturday morning, a visit is obligatory. I blogged about it here. Woodstock This once-gritty neighborhood has been reinvented as Cape Town’s design precinct. It’s home to Neighbourgoods, and also to a long stretch filled with artists studios, boutiques, restaurants, and galleries. The one-off shops and co-ops here are your best bet for authentic, locally made souvenirs. The side streets off the main Albert Road drag have some of the most spectacular street art murals adorning the walls of homes. Read more about it here. Shopping I crafted the ultimate shopping guide for Conde Nast Traveller UK. There is, of course, the V&A Waterfront, the most visited tourist destination on the continent — more so than the Pyramids, even. While it has a lot in one place, at the end of the day, a mall is a mall, and you can get Zara at better prices back home anyway. Your best bets for independent labels are Woodstock and the downtown/CBD area, where you’ll find local boutiques with SA designers like Mungo & Jemima, MeMeMe, Alexandra Höjer, Charlie H, and Missibaba. For interiors, Haas Design Collective is a lovely little gallery and coffeeshop in Bo-Kaap; Ebony is a great concept design store; and Avoova has really interesting decor items made from ostrich shells. Kirstenbosch National Botanical Garden More than 7,000 species thrive here, on the slopes of Table Mountain. It’s also home to open-air concerts and movie screenings in the summer. Check out this stunning pic I took here and a blog post I did here. Winelands Drive this scenic region about 45 minutes away from Cape Town — Franschhoek in particular has charming hotels and excellent food. (Of course SA is known for its wines, but I don’t drink, so I can’t help you much there!) I wrote about it a bit here and here, and did a guide to Franschhoek shopping here. Camps Bay If you’re in Cape Town during the summer months (October – March), the beach is going to play a big part in your trip. This is one of the most popular, with locals and tourists alike, and it has a very trendy, bumping, South Beach vibe. Be warned: the the ocean here fairly cold year-round — warmer waters lie on the Indian Ocean. Safari There are no real safari lodges close to Cape Town — any place that claims it is is really just a glorified zoo. If you can’t make it out to Kruger, there are a few decent places four to six hours away that you could make a road trip out of. I blogged about my visit to Gondwana Game Reserve here. Depending on your preferences, I’d recommend looking for hotels or apartments in one of three general areas. The V&A Waterfront is home to some of the posh big-name hotels, and is a fairly touristy spot that you’ll likely spend a fair amount of time — there are lots of restaurants, a giant mall, museums, and it’s where the Robben Island tours depart from. In the Central Business District, you’ll be centrally located and close to more independent, characterful shops and restaurants and residential neighborhoods. And finally, if you want to stay on the beach, you’ll find some of your best bets along Camps Bay, a trendy, South Beach-like drag, or Bantry Bay, a scenic, exclusive enclave. If you’re looking for apartment/house rentals or self-catering options, AirBnBs are always popular, but homegrown sites like Accommodation Direct are great for finding reasonably priced local options throughout the area. Elsewhere by ninemsn, Cape Town, Rivaling Australia for Best Brunches? New York Times, Have Some Dim Sum with your Shirts? Conde Nast Traveller India, Which Vineyard in South Africa Is for You? an hour from Cape Town, has a glamorous new hotel in the form of Leeu House. 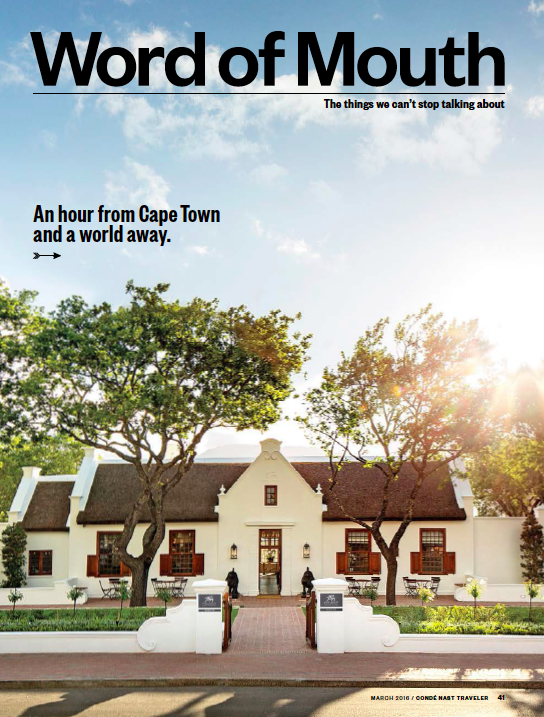 For the current issue of Conde Nast Traveler (US), I wrote a piece on that opening along with other Winelands happenings. Time to plan that side trip!